What separates this pull up bar from the rest: A special EVA pad is used to increase stability and gains better friction for support. It also helps protect your door frames better then all others. Make sure you don't buy a cheap knock-Off! Fits all standard and Olympic bars. Simply put one end of the bar in the platform cup and load up the other end with all the weight you can handle. Our Wall Mounted Pull Up Bars are built with professional quality hi-grade steel with a non-slip powder coating and comfort grips. Easy to assemble: mount on solid wall or wood beam. 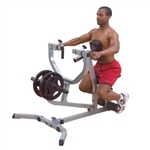 Offers multiple grip positions for a variety of exercise options. It's a combination inverted back extension and oblique flexor set at an exact 45 angle for ultimate conditioning. Strengthen your lower back safely and comfortably on the strongest 45 Hyper available. nylon bushings for super smooth operation. 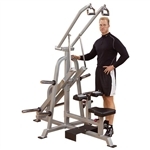 Transform your Body-Solid Power Rack into a multi-workout machine. A dynamic addition to any exercise program. 20inch seated row bar on the low pulley and continue working out. Can be used with Olympic weights or optional 190 lb stack. Powertec Workbench Leverage Gym WB LS16 new design is unique from the rest.